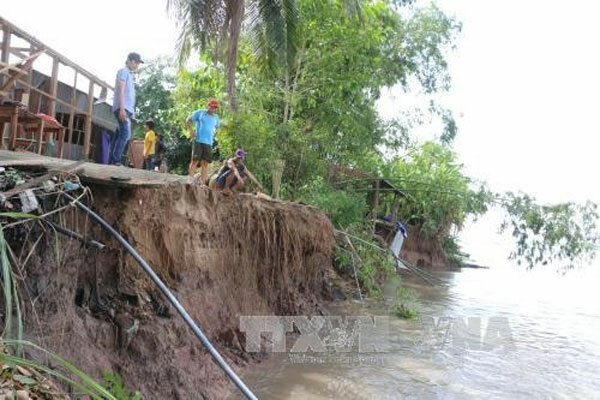 VietNamNet Bridge – The southern province of Dong Thap on Wednesday extended its state of emergency as the erosion worsened, with a section of the riverbank covering some 600m affected so far. A section of the Tien riverbank, running from Muong Ca Lach to Binh Thanh Market in Binh Hoa Hamlet, Thanh Binh District, was reported to have been eroded by 150m over the last few days, since the last state-of-emergency declaration last month. The authorities also said another 600m of the riverbank from Muong Ca Lach towards Phong My Bridge had already fallen into the river or was in danger of being eroded. Dong Thap authorities said a deepening riverbed, with several spots believed to range from seven to more than 20m in depth, was causing this large-scale erosion. Additionally, authorities also detected a vortex that was about 35m in depth, some 100m from the eroded bank. River erosion has been repeatedly occurring in the area since last month, triggering a state-of-emergency declaration on April 28 when some 227 households were believed to be in danger due to the erosion. Thanh Binh People’s Committee has called on residents living in the affected area to evacuate while asking the provincial authorities to urgently build resettlements for those in need of evacuation. An inspection team from the Ministry of Agriculture and Rural Development will visit the eroded area on Thursday. Dong Thap earlier asked the Government for VND82 billion (US$3.6 million) to address the erosion issue. The province is not the only one facing severe river erosion in the Cuu Long (Mekong) Delta. Last month, An Giang Province saw 14 houses collapsing into the Hau River, with damage estimated at more than VND9 billion. The authorities had to urgently evacuate 108 households from the area.